I began a new photography project recently that is an off-shoot of my nature photography but focuses on the trash that society throws on the ground and eventually ends up in the water. 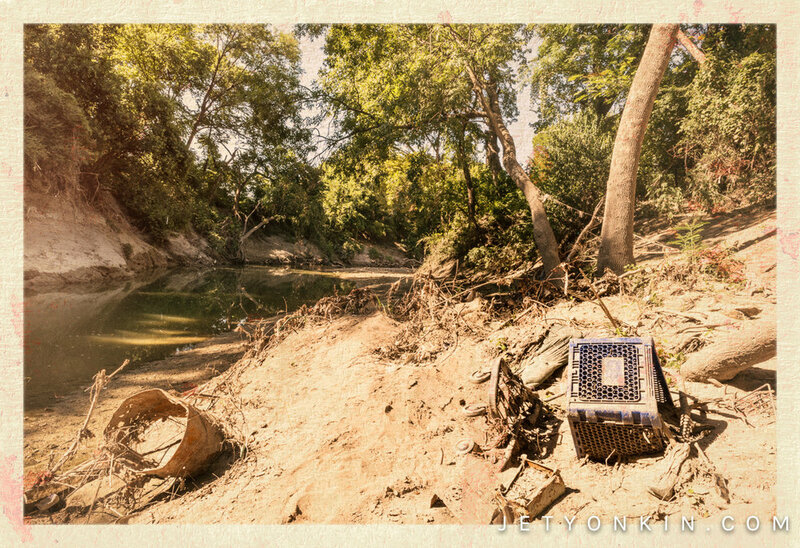 While hiking in the various nature areas of Dallas, this accumulation of trash is most noticeable in the many shopping carts that have built up in our city's waterways. For this new project, I sought out shopping carts along White Rock Creek as it winds through Harry S. Moss Park and photographed the beautiful natural scenes I found on the water, marred by the trash and shopping carts that have hung up on roots or embedded themselves in the mud. In the post-production of the images, I worked to create the effect of looking at vintage prints on various types of paper, stained over the years, and imperfectly printed. Other than the effect of the stains and imperfections, this style of editing is vastly different from how I tend to present my work, with much less contrast and saturation. I wanted the deterioration of the "prints" to speak to the deterioration of the environment depicted in the photograph. I'm happy with how this project came out and I have already been photographing new scenes to be included in this set in the future. Enjoy!